. 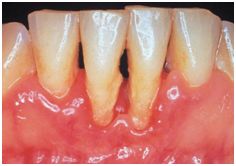 : What is gum disease, also known as gingivitis? 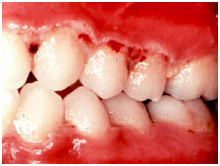 Gum disease, also known as gingivitis, is an infection of the gums. It is caused by PLAQUE, a sticky film that collects on teeth and gums. Plaque makes acids and toxins that can make gums red, puffy, or bleed. Over time, gum disease can cause gums to pull away from the teeth. This can form pockets between the teeth and gums. Germs can become trapped in these POCKETS, causing the BONE around the teeth to weaken.